Channel, The. An International Quarterly of Occultism, Spiritual Philosophy of Life, and the Science of Superphysical Facts. No official connection with any sect, society, or creed 1915-1917 Quarterly Hollywood, CA. Publisher: Channel Publishing Society. Editor: Marie Russak (Hotchner); Vance Thompson. 1/1, October-December 1915-July-September 1917. $1.00 (then $2.00) a year. 104 pp., 6 x 9. Marie Barnard Russak Hotchner (1865-1945) was an American singer (performing for a time with John Philip Sousa's band) and was said to have studied psychology with Charcot in France,which was reflected in several of her articles in the journal on psychology, hypnotism and suggestion. She was also a Theosophist (though of a particularly "neo-Theosophical" bent: Blavatsky's name appears in the journal only twice, and that in passing) and was Colonel Olcott's private secretary in his last years. She was the one reading to him-from the Bhagavad Gita-when he died in 1907, placing her in the powerful and convenient position of being the one who, as a psychic, could vouch for the appearance of the Masters at the deathbed and for their wish that Annie Besant should succeed Olcott as President of the Theosophical Society. This psychic ability also allowed her to vouch for Besant's own direct contact with the Masters and to witness and describe the young Krishnamurti's first jaunt into the astral. She was closely connected with the Theosophical Colony at Krotona in Hollywood and was one of the founders, with Besant and James Ingall Wedgwood, of the Order of the Temple of the Rosy Cross, a short-lived Theosophical effort to restore the lost mysteries of the western occult tradition through Christian, Rosicrucian and Masonic ceremonial workings and elaborate ritual garb. She was also involved in the early days of A.M.O.R.C., whose ceremonials she is said to have helped draft, and the journal carried both advertisements for and articles by H. Spencer Lewis. Russak returned the favor by advertising the journal in Lewis's American Rosae Crucis. The journal proclaimed itself independent of any sect but has a fair amount of Theosophical material (references to and contributions by C.W. Leadbeater, for example, and interminable discussions of the sixth root race then emerging on the American West Coast), all of a particularly psychical sort. 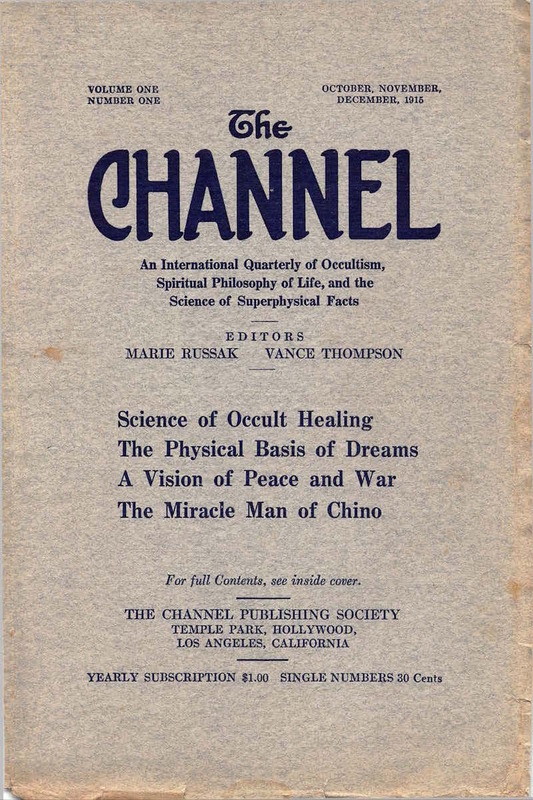 It also carried lengthy articles by Russak under her own name and as "Helios," her mystic name in the Temple of the Rosy Cross, notably on "The Science of Psychic Healing"-she had early on made a study of Christian Science-and on dreaming, occultism and art, etc. The journal carried poems by Ella Wheeler Wilcox, lengthy discussions of the mediumship of "Patience Worth," contributions by Leonard Bosman,Estelle W. Stead, John Hazelrigg, Elsa Barker (on her relationship with David Patterson Hatch both before and after his death), and others. Henry Hotchner, a real estate developer and one-time manager of John Barrymore married Russak in 1916 and also contributed articles, notably on projection of the astral double. The co-editor, Vance Thompson (who also wrote as Cuthbert Tunstall), resigned after the first issue. The last issue of the journal announced its suspension "for the present time" because of problems arising from shipping and mail during World War I. It was not resumed. Russak/Hotchener later edited World Theosophy, and The Theosophist (1930). LOC; NYPL; University of Pennsylvania; BL.